Okay, this Ornament Tree isn't technically an advent calendar but I think it could work perfectly as one. Wouldn't it be fun to choose twenty-five beautiful little ornaments to fill the tree with? 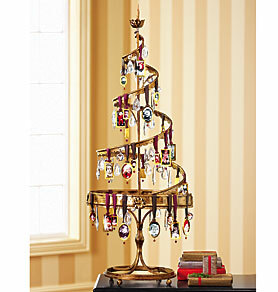 Yes, I like your idea, but can you find this darling ornament tree--and I mean that, I love it--for less than $179?!? (http://www.exposuresonline.com/ExposuresOnline/Shopping/ProductDetail.aspx?CID=Gift+Ideas&SCID=Seasonal%2fHoliday&CollectionID=L0900TREE&num=162) Yikes!